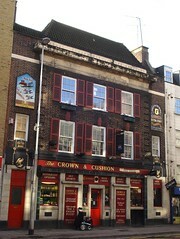 Pub on Westminster Bridge Road near Lambeth North Station. secretlondon visited on a Tuesday evening in November 2008. Old Speckled Hen was £1.40/half; they also had Greene King IPA and another pump with its clip turned round. It was quite dark and football was on in one corner. Thai food is available upstairs (and they also do takeaway and delivery). Accessibility: Small step at entrance. Toilets not investigated. Food is upstairs. Last visited by secretlondon, November 2008. Last edited 2014-01-18 16:19:49 (version 7; diff). List all versions. Page last edited 2014-01-18 16:19:49 (version 7).